Sub-Hunting Planes Use High-Tech Gear To Search For Flight 370 : The Two-Way Two of the most advanced maritime surveillance aircraft — Australian P-3 Orions and U.S. P-8A Poseidons — are scouring a stretch of the Indian Ocean for signs of the missing Malaysia Airlines jet. 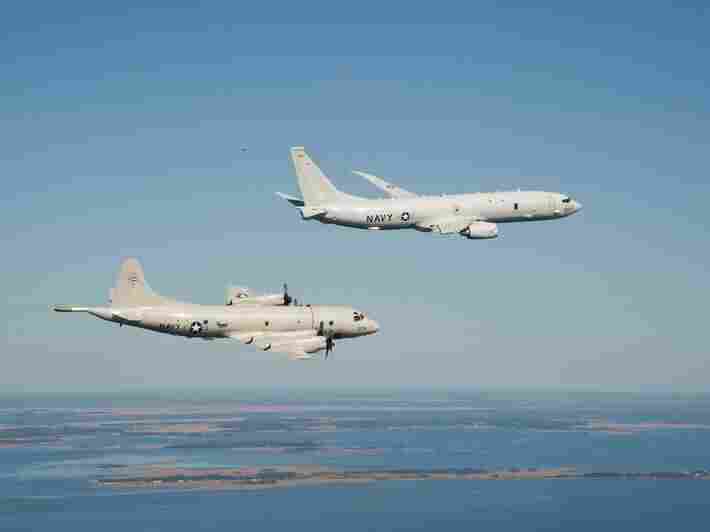 A P-8A Poseidon (top) and a P-3 Orion are shown flying off the coast of Maryland. Two of the most advanced maritime surveillance aircraft are being pressed into service to search for possible wreckage from Malaysia Airlines Flight 370 in the middle of the Indian Ocean. Australia's U.S.-made P-3 Orions and U.S. Navy P-8A Poseidons bring high-tech sub-hunting gear to bear in the search for debris. They are combing a remote stretch about 1,500 miles from Perth, Australia, where satellite images taken March 16 showed floating objects. As sophisticated as the search planes are, the task is daunting. Weather and the sheer distance from bases near Perth to the target zone are complicating efforts to answer the question of what — if anything — is out there. Because of ocean currents, the search area has also expanded since the satellite snapshot was taken. And it's possible that whatever was seen by satellite is now thousands of feet deep at the bottom of a vast ocean. Both the P-3 and the P-8 have the range — but only just — to get to the general search area, spend a few hours looking and then return. The P-3 can fly out about 1,500 miles and spend three hours searching before having to turn back, while the P-8, a modified Boeing 737, has an operational range of roughly 1,400 miles with four hours on site. The P-8's AN/APY-10 radar — designed to locate enemy surface contacts such as submarine periscopes — and the Australian P-3's somewhat less sophisticated radar set would very likely be the first to pick up on any floating refuse, says Sam LaGrone, editor at U.S. Naval Institute News and a former maritime reporter for Jane's Defence Weekly. "It's not like looking out the window," he says. How Would They Spot Wreckage? Once a radar contact is made, typically from a fairly high altitude, the plane can dip down to get a closer look, switching on an EO/IR (electro-optical/infrared) ball housed under the aircraft. These are similar to the pods you might see hanging under a police helicopter, LaGrone says. "Pretty much all military radar are built to filter out ocean spray, rain, clouds and all other manner of potential interference via different frequencies and different methods," he says. The EO/IR unit, though, blends high-tech-camera images with infrared input into a "very detailed conventional video image" similar to what military reconnaissance and strike drones use. Darkness limits the effectiveness of the cameras, and the chilled debris — now nearly as cold as the surrounding ocean — also means limited infrared input. "Maybe [the wreckage is] down on the bottom; maybe it's floated away," he says. "If it's on the surface, the radar would be able to detect it relatively easily." Cmdr. Mark Turner, the chief of the policy division for the U.S. Coast Guard's Office of Search and Rescue, says the bigger the waves, the more "sea surface clutter" will appear on radarscopes and that the search is going on in the so-called Roaring 40s, referring to latitudes where the oceans are notoriously rough. What Are They Likely To Find? Turner says planes usually sink. In the case of Air France Flight 447, which crashed off the Brazilian coast in 2009, a tail section was located, but most of the flotsam was "seat cushions and service trays," he says. Turner says the Coast Guard uses computer models to determine how far debris and survivors might drift with the winds and currents. "The longer it's been out there, the greater the uncertainty" about where to look, he says. It's been 12 days since the plane disappeared on March 8. What If The Debris Has Sunk? LaGrone says both aircraft are capable of dropping sonobuoys, which are designed to detect submarines, but they might not be of much use for an object sitting on the bottom of the ocean. You can see a video of a P-3 dropping a sonobuoy here. "If it's underwater, you might be able to detect that with sonar, but it really depends on the circumstances," he says. "If you determined there was something there — either on the surface or on the bottom — that's when surface ships would arrive with more sophisticated sonar and underwater equipment to take a closer look," LaGrone says. In a nine-hour search of the area on Thursday, a U.S. P-8 came back empty-handed after finding only a freighter and some dolphins, ABCNews says. 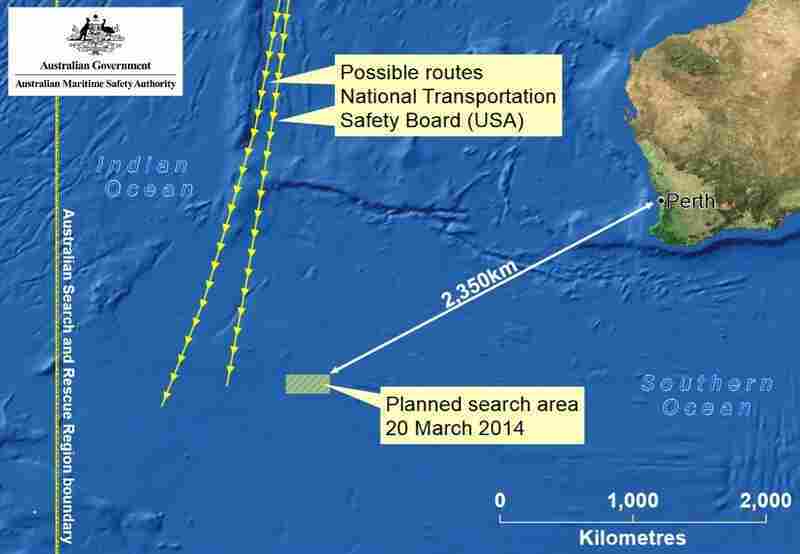 The search area about 1,500 miles southwest of Australia in the Indian Ocean. 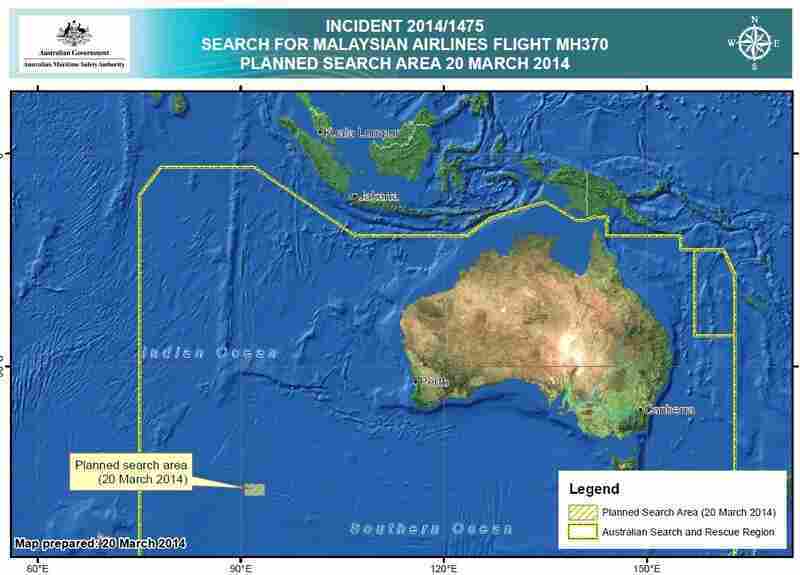 This image adds the routes that investigators believe Malaysia Airlines Flight 370 might have taken. "The plane worked back and forth through its search area in a lawn mowing pattern. ... The Poseidon had enough fuel to scan for three hours and cover 4,100 square miles before having to begin the three hour trip back to its base north of Perth, Australia. The crew was disappointed that it hadn't found anything." The Telegraph says a merchant ship was also diverted to the area, but apparently found nothing either. The Australian Maritime Safety Authority says a C-130 Hercules has been dispatched to the area "to drop marker buoys to assist with the search and indicate water movements," the newspaper says, adding that "commercial satellites have been redirected to capture further images from the area."